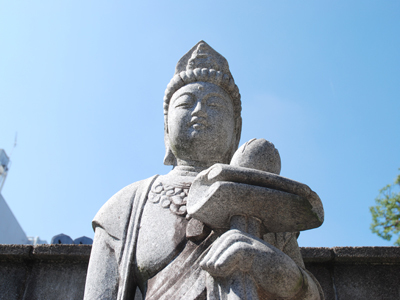 This is a temple of the Chion-in School of the Pure Land sect of Buddhism. It was established in 1606 by the feudal lord of the Tsuchiura domain in presentday Ibaragi prefecture,Matsudira-izunokami-Nobuyoshi,for his mentor,the high priest Gakuyo. During the period of the third head priest,the temple became distanced from the Matsudaira family and gradually impoverished. According to the temple legend,this third priest loved cats.One night,his cat disguised itself as a beautiful princess and performed a dance happily despite the economic difficulty of the temple. The priest was enraged and chased away the cat. Severaldays later,however,the cat appeared in his dream and told him that it had persuaded the Matsudaira family to support the temple again. Thus,the cat repaid its obligation to the priest and the temple was revived. Since then,the temple has greatly revered the soul of the cat. To commemorate the priesｔ’s cat,the old pine tree in front of the main building is shaped in the form of a cat lowering its body. 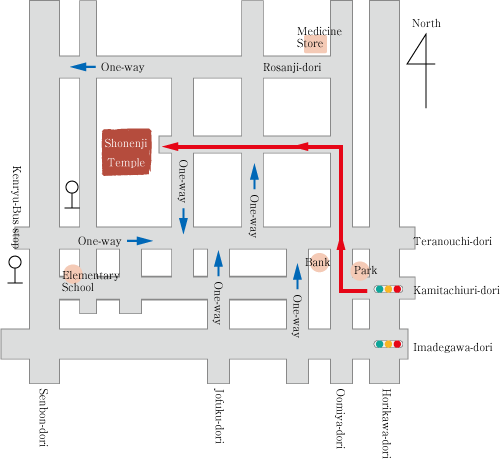 For this reason,the temple came to be called Neko temple or Cat temple. The temple holds memorial services for dead animals and a monument has been erected in the temple graveyard to console the souls of dead animals. Shonenji Temple has been fondly referred to as neko or cat temple thanks to the folk tale of a cat that brought about a reconstruction of the temple to requite the kindness of the temple's chief priest during the Edo era. Since then, the temple has held memorial services for deceased animals in a cordially. Many people have difficulty with the loss of an animal that had been brought up with great care as one of the family members. Because they cannot speak their minds like humans, the family is smitten by remorse with profound sorrow. To lend a helping hand to those who are grieving the loss of loved ones, I am devoted myself to be of any help to ease the feelings of sorrow. Shonenji Temple is holding animal memorial service in spring (April) and autumn (October) every year, at this temple main hall. It is a special hall where animal memorial services are held and our chief priest individually reads the sutras to commemorate the deceased animals with extreme courtesy. Also, pet's ashes can be placed in a grave located in the hall so that visitors can clasp yours hand in prayer a visit to the remains of their pets on each occasion. Known as Aito, it is a grave tower newly constructed in 1998. The tower's round stone pagoda engraved with "love" in a kanji character represents our hope for the deceased animals rest in peace and bliss in the Paradise. It is a beautiful cemetery featuring moss garden in the style of borrowed landscape. Individual graves may also be set up to attain Buddha-hood the death of a treasured family member. 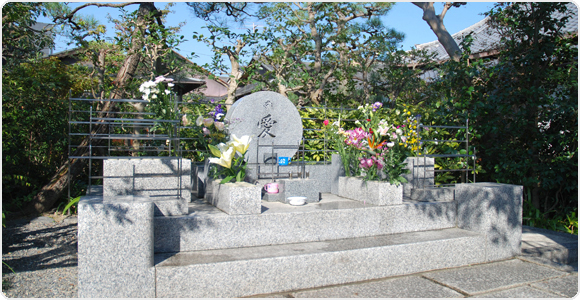 For more information about individual graves, please visit Shonenji Temple for consultation. Pets are considered as an important part of life, holding a special place in the heart but illnesses come by surprise. Because they cannot speak their minds through words, the illnesses are found too late sometimes. 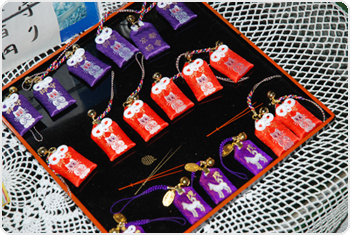 Shonenji Temple offers a personal amulet to wish for a long healthy life for your pet. You may also obtain one for your health! 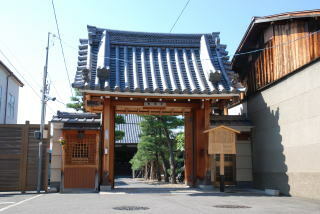 Feel free to visit Shonenji Temple to wish your precious ones good health. 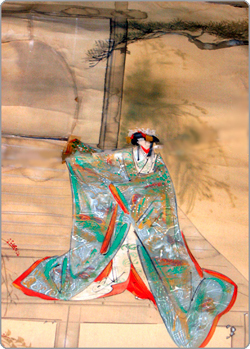 It is designed by the chief priest featuring his cat, Miko, as a model and the cat clasps its hands in prayer. Shonenji Temple, also known as Neko Temple, was established by the temple's Kaiki (founding patron) Shonin in 1606, the 11th year of Keicho era when the first chapter of Edo era began, when Matsudaira Nobuyoshi, who is Tokugawa Ieyasu's adopted brother and the feudal lord of the Tsuchiura domain, made a convert to Buddhism. 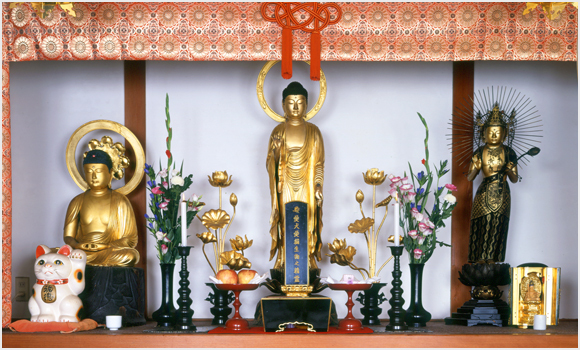 At that time, the temple was well flourished after receiving 300 koku of temple estate. Copyright (C) 2015 SHOUNEN-TEMPLE. All Rights Reserve.